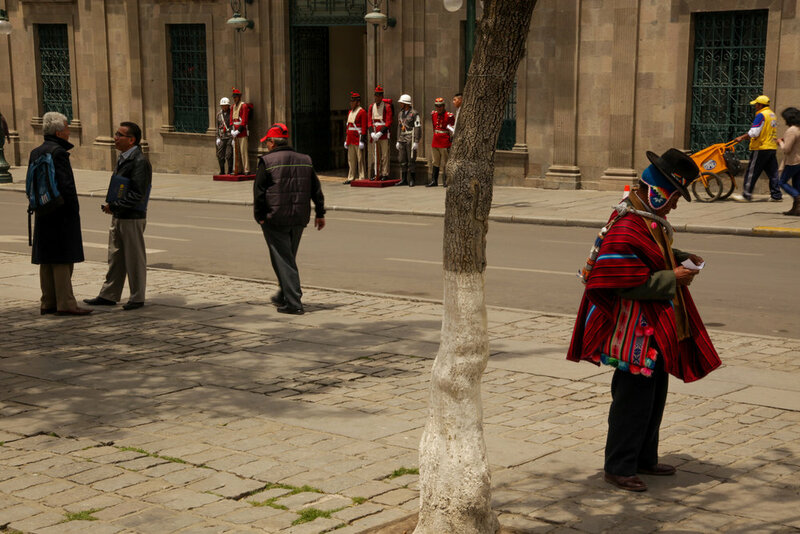 La Paz, the de facto capital of Bolivia, is a city I’ve always wanted to visit. 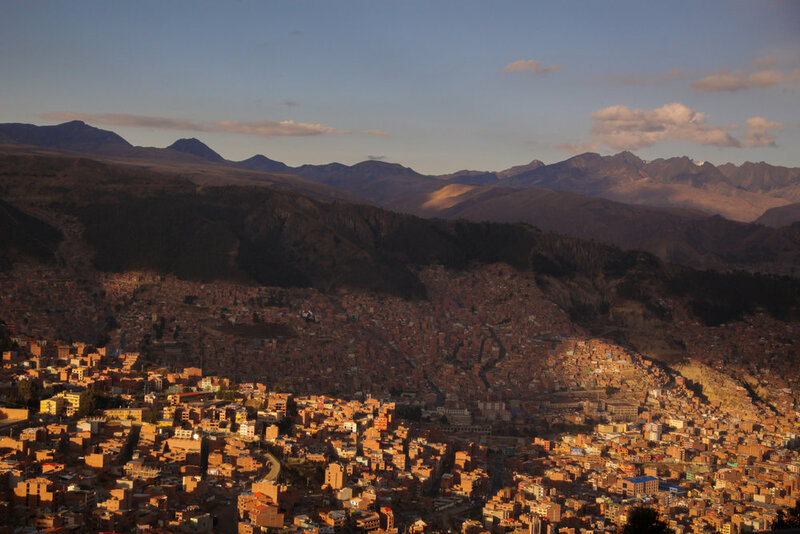 Surrounded by mountains, between 3000 and 4,000 meters above sea level, populated mostly by colourful indigenous peoples and framed by a crazy cityscape that tumbles into a valley of skyscrapers, La Paz has always held a certain mystique. For a few days, we got to explore. We checked out a tooth festival, rode the cable cars, visited a massive market, I got attacked by a woman with a stick, and we nearly got struck down by some Ninja. As we are to find out, In La Paz anything can happen. It is a little bit scary, but also one of our favourite places in South America. Below are some highlights of things you should do, and below are a few of the more interesting videos you can watch to find out more about La Paz. You can also watch the video of our trip below. We decided the best introduction to the city was to take a walk towards the Plaza Murillo, which is located in the old town and near many of the historic government buildings. Along the way we passed by the infamous San Pedro prison, apparently a small city within a city - where between 1500-3000 prisoners are squeezed into a facility built for 600. Families live there, and apparently, the prison has its own rules, laws and infrastructure. There was some commotion near the gates. I raised my camera to take a photograph the guards started yelling at me. It didn’t seem like a good place to hang around. That said, you can apparently tour the prison, and it is subject of some books and documentaries - more info over at the BBC. After a pretty good coffee in The Writer’s Coffee - which had a kind of hipster librarian vibe (and was also a bookstore) - we ambled up to our destination of Plaza Murillo. Here kids feed the hundreds of pigeons, old people doze on park benches, and nearby there are various flamboyantly uniformed guards protecting the official buildings. The place had a lot of character and was seemingly mostly overlooked by tourists. In the southwest corner of Plaza Murillo is the Museo Nacional de Arte, housed in an attractive old pink building. We paid the entrance fee, and just as we were settling into enjoying some of the beautiful artworks, we were told it was closing for siesta. It might have been good, had they stayed open. We wandered down the city mall and walked over a bridge the central cultural centre - which was a labyrinth of market stalls and a good place for some fresh fruit juice. Outside there seemed to be some tooth festival, where high school students were celebrating the benefits of brushing and dentistry. At the heart of La Paz is the Church of San Francisco, where there appeared to be an important event going on - most likely a wedding. People were dressed up, there was a band, and it seemed like everybody was there just checking it out. Due to the scrum at the door, we weren’t able to get inside the church. The next day we hopped onto the modern new cable car system, which is the longest and highest in the world. We were headed up towards the city of El Alto, stopping first at the massive central cemetery along the way. 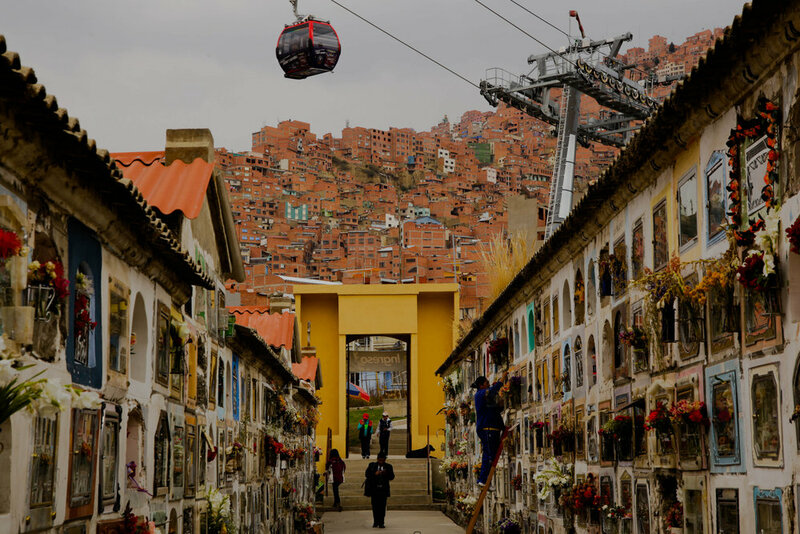 If you do only one thing in La Paz, taking the cable car is probably it. You glide effortlessly above the orange brick jumble of the city, climbing (or descending) the steep valley walls, while surrounded by the snowy peaks surrounding the city. The Yellow Line cable car line probably has the best views and the steepest gradient, although the Red Line is more accessible from the city, and also stops at the cemetery. We took the Red Line up to the cemetery, disembarked, then got back on and travelled up to El Alto. After exploring the market there, we took a taxi to the Yellow Line as they are not connected. 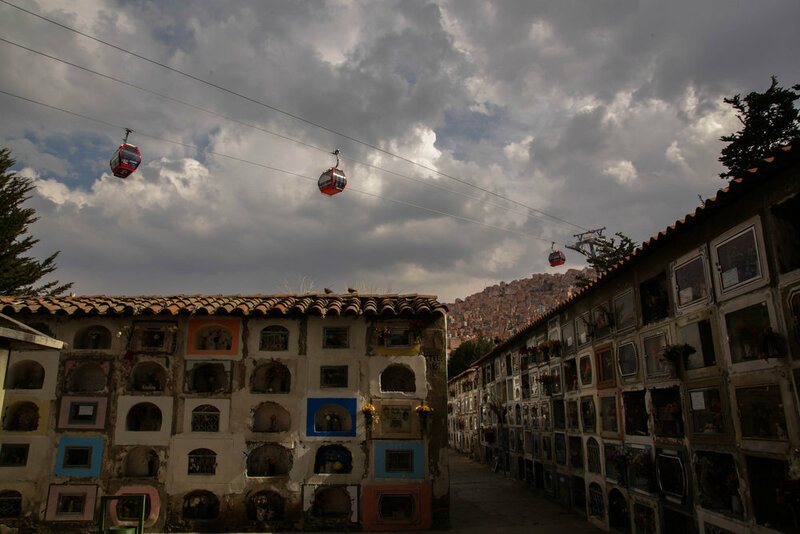 La Paz cemetery is spread over 3km and is the largest in Bolivia. It mostly a maze of high walls which a filled with decoratively furnished tombs - photos, flowers, candles make for thousands of diorama-like crypts. Overhead the red line cable cars glide, making for a slightly surreal and contrasting atmosphere. There isn’t a tremendous amount to see here, but it is peaceful and a beautiful place to wander around. 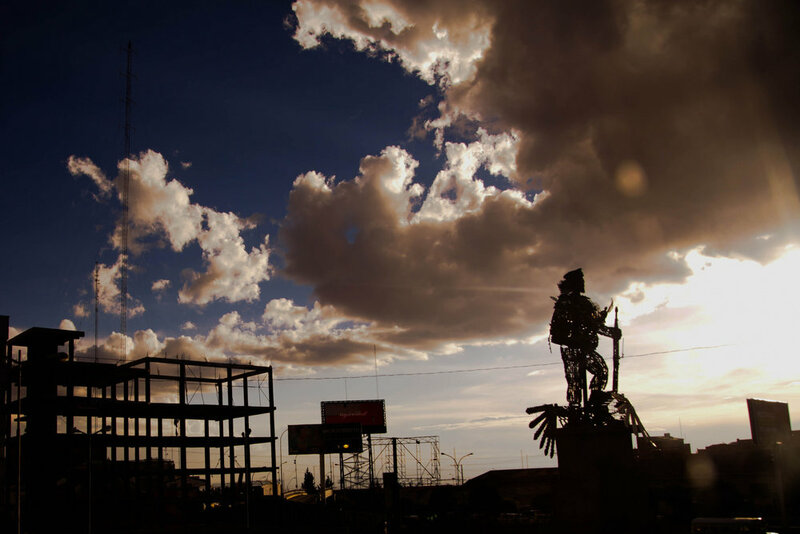 El Alto is one of the fastest growing cities in Latin America. Perched at the top of the valley overlooking La Paz it averages over 4000 meters above sea level. It is a sprawling new city, which is usually only visited by outsiders because the airport is here. It is poor, dusty, chaotic and congested. 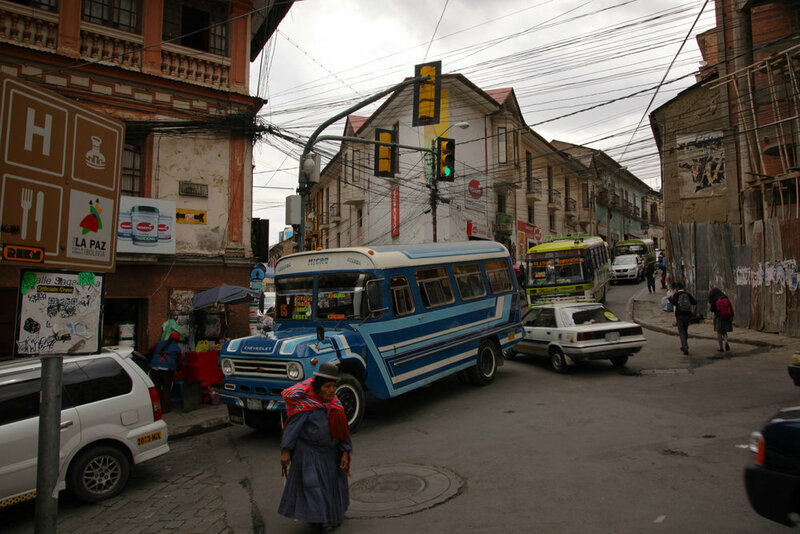 But El Alto has a lot of character and an incredible market which seemed to stretch for miles in every direction. Walking around for several hours we didn’t see a single other foreigner or tourist. The place had an air of adventure, mystery and danger - an area with witchcraft shops, magic and other secret goings-on. At one stage I a fabric stallholder attacked me with a stick because she thought I was taking a photo. At the time I didn’t even have my camera out, although I did have a GoPro attached to my bag. I was standing there minding my own business when she started poking a long thick wooden stick through the clothes at me, jabbing and lunging at me. At first, I didn’t register, but once I did, we decided to move on from that shopping experience. An unusual sort of customer service, but a result of a belief that having your photo taken might steal your soul. Generally, in El Alto and up at this market, it didn’t seem appropriate to be flashing around expensive equipment, so the DSLR camera stayed in the backpack. Later we wandered into one of the famous architect Freddy Mamani’s garish and colourful “New Andean” buildings. We were interested in them as they looked a bit like psychedelic space-age gingerbread houses. Apparently, he was trying to break out of the more traditional brick buildings of El Alto, and they were kind of incongruous in the otherwise dowdy city surroundings. However, once we got inside what seemed like an empty shopping mall, we were followed by a someone dressed like some scary looking Ninja, armed with a weapon, a pistol and covered head to toe in black, including a motorcycle helmet. I guess it was security. As we were the only people in the building, they were keeping a close eye. Finally, after getting lost in the market, we took a taxi to the Lellow line” cable car. 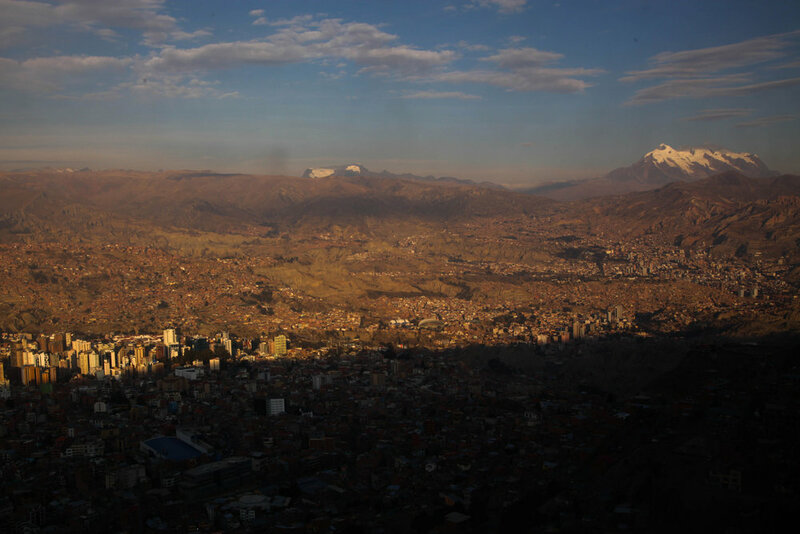 On the descent, to La Paz, we enjoyed the best views we had had so far of the city. A good informative video is Getting a Taste of Bolivia - One Day in La Paz, Highest Capital in the World by Kathrin Hilde's Project Made . This video elaborates on some of the superstitions of the people here, why the women dress as they do, the national flag and the cable car system. A somewhat bouncy video that covers similar terrain is La Paz, Bolivia Travel Guide: Things to see & do! By CupofTJ. This self-described quirky vlog also breezes through Cholita wrestling, which seems to be a bit of a tourist attraction and the Witches market. A good summary.